What does SNOW mean in Unclassified? 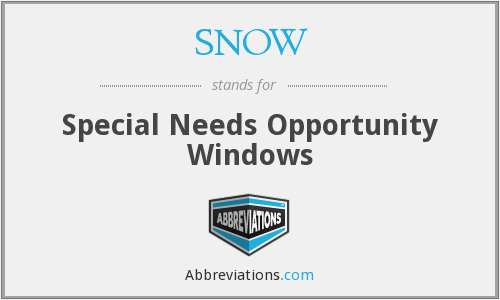 This page is about the meanings of the acronym/abbreviation/shorthand SNOW in the Miscellaneous field in general and in the Unclassified terminology in particular. How popular is SNOW among other acronyms? "SNOW." Abbreviations.com. STANDS4 LLC, 2019. Web. 18 Apr. 2019. <https://www.abbreviations.com/term/2042242>.